U.S. high school graduates left over $2.9 billion in free federal grant money on the table last academic year, according to a new analysis by NerdWallet. Their mistake? Not completing the Free Application for Federal Student Aid, or the FAFSA. Our figures show that 47% of all 2013 high school graduates didn’t complete this required first step that could’ve earned them Pell Grant money, which unlike student loans, does not need to be paid back. In response to low FAFSA completion rates, President Barack Obama and the U.S. Department of Education have taken action to provide greater transparency to high schools about the FAFSA and financial aid. Jan. 1 marked the start of the 2015-2016 FAFSA season. To encourage more students to file the FAFSA, NerdWallet took a look at how much unclaimed Pell dollars were left on the table in each state in the most recent FAFSA cycle. To see the full state-by-state breakdown, click here. Nationwide, graduating high school seniors who were Pell-eligible in 2013, but didn’t complete a FAFSA, missed out on $2,955,475,413 in potential Pell Grant aid. Utah was home to the largest percentage, 40%, of Pell-eligible seniors who didn’t complete a FAFSA. Over 100,000 seniors in California — about the entire population of high school graduates in New Jersey — could have qualified for Pell Grants if they filed their FAFSA. 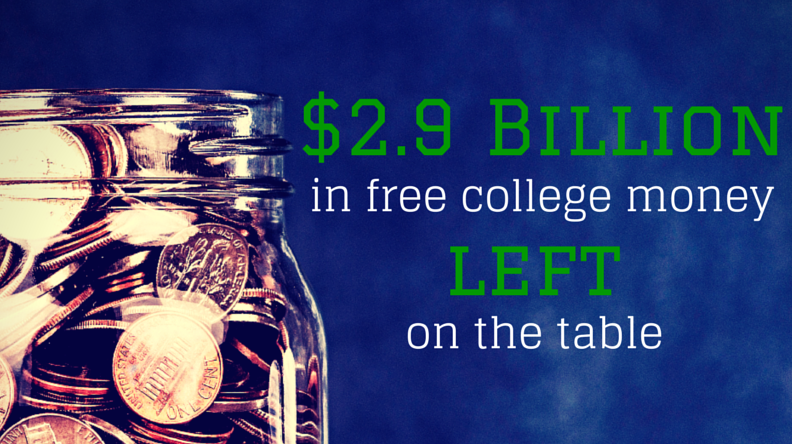 Students in the Golden State lost $396,401,205 in Pell Grant dollars. Because aid is disbursed on a first come, first served basis, the best way for parents and graduating seniors to ensure that they don’t miss out on free federal financial aid is to fill out the FAFSA now. NerdWallet’s free FAFSA Guide can help walk you through the process step by step. Unclaimed Pell Grant Money Across the U.S.
Move your cursor over each state to see the totals in millions left behind by 2013 high school graduates. In each state, we looked at Pell Grant-eligible graduating high school seniors who didn’t complete the FAFSA in the 2013-2014 application cycle and multiplied that number by the average amount of Pell aid disbursed to all students. Number of high school graduates not completing FAFSA = number of 2013 high school graduates — number of completed FAFSA applications by June 2013. Why we focused on Pell Grants. As the largest source of federal funds for college, Pell Grants are free money and a major part of most financial aid award packages — before work-study funds and loans are tacked on — for college students who cannot afford to pay full price. We used the most recent data from the Department of Education to find the average Pell Grant award across all colleges and universities in each state. The maximum amount awarded in the 2013-2014 cycle was $5,645; for 2015-2016, it has increased to $5,830. How we estimated the number of high school graduates who didn’t complete the FAFSA: Using federal data, we looked at how many high school students completed the form from January to June 2013, the final deadline for most colleges. Then, using projected graduation data from the Western Interstate Commission for Higher Education, we took into account the total number of high school graduates in each state to find the number of graduating seniors who didn’t complete a FAFSA. How we assessed Pell eligibility for students who didn’t complete the FAFSA: Using 2013-2014 Pell Grant-qualifying applicant data from the Florida College Access Network, we found the number of graduating seniors who could have been eligible for a Pell Grant if they filled out a FAFSA. Like the Florida College Access Network, we assumed the rate of Pell-eligible recipients is the same for students who didn’t complete the FAFSA as for students who did. *Unrounded data used in calculations.